On Friday, Janira and I had lunch with our colleague Natalia Mykhailivna from the Methodological Cabinet. The MetCab director has been sick for a few months with stomach cancer, so I asked Natalia how she (Tetiana Petrivna) was doing. Natalia said better. On Sunday, Janira was at my place to plan some trainings when Natalia called to remind Janira to tell her sister “happy birthday.” Natalia then told Janira that Tetiana Petrivna died that morning. Needless to say, the mood at school on Monday was somber. We had a last-minute teachers’ meeting after the second lesson which ended up being mostly about Tetiana Petrivna’s funeral and arrangements to go to her village and pay respects. My school director was matter-of-fact about it all, but his face was distressed and sad. Tetiana Petrivna died much sooner than expected. Everyone was in a bit of a shock. On Tuesday, Janira and I joined the MetCab members, directors of district schools, and many other people for Tetiana Petrivna’s 3.5-hour funeral. Three and a half hours. The first hour at her house: people who wanted to went inside to view the body — I chose not to — as the male brass band played. The priest and male band-turned-choir went inside and we heard some intermittent singing. Eventually they brought Tetiana Petrivna’s body out in an open casket and an entire service was performed. Before leaving her house, some people lined up to kiss Tetiana Petrivna. The next hour and a half consisted of a procession — a very large procession, Janira remarked, to which I replied that as director of the district MetCab Tetiana Petrivna touched many people’s lives — around the village to the church. As the procession began the casket paused not far from Janira and me. It didn’t even look like Tetiana Petrivna; I think in part because her eyes were closed and those held so much sparkle and personality when she was alive. At the church, which Janira and I did not enter, there was another hour-long service. Finally they emerged from the church and we processed to the cemetery for a quick, final, 25-minute ceremony. The hardest part for me was watching her husband and daughters — Tanya is 16-17 and Olha, my pupil, is only 12 — follow the casket for hours, ending at the cemetery where they — and many others — broke into loud sobs as the casket was closed and lowered into the ground. Grief. I remarked to Janira that when I die, I’d rather there be a very short funeral — or none at all — and a long, joyful memorial service celebrating my life. I haven’t written much about Tetiana Petrivna, but she has been a constant welcoming presence and fantastic resource since Janira and I arrived at site last December. (I include Janira because the MetCab is for the entire Sniatyn region/district and Janira’s village is in the district.) One of the first Ukrainian celebrations we attended was the MetCab’s holiday “concert.” Tetiana Petrivna had also been an English teacher and so spoke good English; she was always inviting Janira and me to visit the MetCab, if for nothing else than a cup of tea and some chocolates — an open door policy at its best. I was so looking forward to working more with her this year. But life goes in different directions sometimes, doesn’t it? The MetCab is still a fantastic place and resource, and Janira and I will continue to work closely with Natalia (who herself was pretty torn-up at the funeral; Tetiana Petrivna was like a second mother to her, she told me). 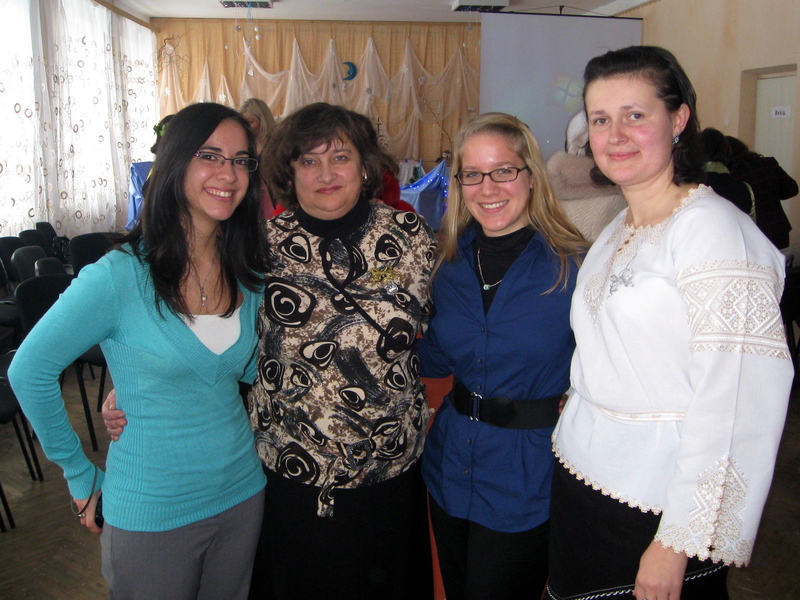 Janira, Tetiana Petrivna, me, & Natalia Mykhailivna last January. This entry was posted in community, culture, pictures, religion and tagged news on 01.11.2011 by taplatt. I’m sorry for your loss and the loss of your community – she sounded like she was part of your rock there in your town and I hope you and others are becoming even closer as a result of this Take care and keep cooking, love your recipes!